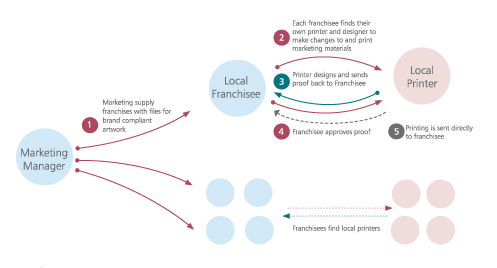 There are two ways a franchise organisation can purchase their print – centrally or devolve responsibility to the franchisee. Centralising the process maintains brand alignment and harnesses the print-buying power. However this comes at a significant administrative cost. The marketing manager in this scenario is spending a significant proportion of their time processing orders. In addition, the Managing Director, Operations and Area Managers are cut out of the process. This makes it difficult for these departments and managers to evaluate promotional activity effectively. And Franchisees may also be overpaying for personalisation. Inefficient? Probably. What about option 2? From head office perspective the process is efficient as marketing sends the files to the Franchisee to personalise and print. However nobody is centrally managing the brand, or able to easily measure promotional activity carried out using print. In both instances there is a salient problem that impacts the efficiency and performance of the business. Web-2-print counteracts this by reducing administrative costs and maintaining brand alignment across the whole network whilst allowing head office or the regional support teams to keep track of local promotional activity.